Uyghur Muslims gather to pray at the Grand Mosque of Kashgar in China’s Xinjiang region at the end of Ramadan, Aug. 31, 2011. At least three ethnic minority Muslim Uyghurs were killed and 20 others injured in clashes in China’s troubled Xinjiang region when security forces opened fire at a crowd trying to stop police from arresting suspects outside a mosque on the eve of the Eid al-Fitr festival, according to police and residents. 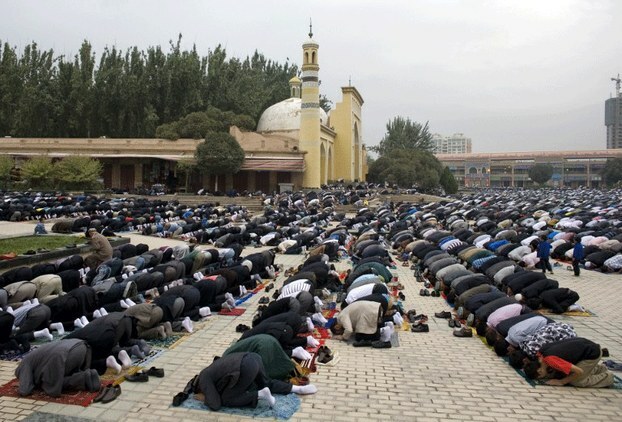 The incident occurred on Wednesday night as Uyghurs in the region’s Aksu prefecture were preparing for prayers ahead of the Eid marking the end of Islam’s holiest month of Ramadan, they said. 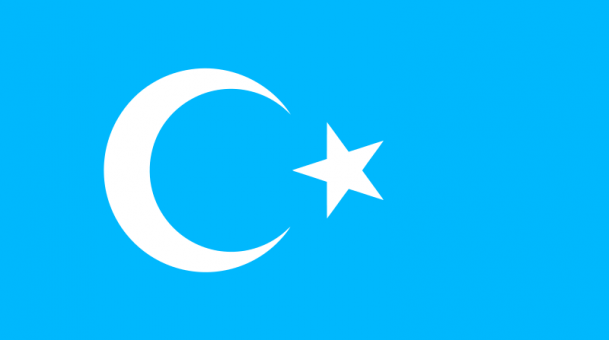 Police said they had gone to the Peyshenbe Bazaar Mosque in Aykol town to arrest four Uyghur suspects wanted in connection with illegal religious activities when they came under attack by an angry mob hurling stones and bricks. As the crowd surrounded a police car and their number swelled to up to 600 people, mostly those who were returning from prayers at the mosque, police brought in reinforcements of about 500 personnel, including a SWAT team, in a bid to restore order, according to a senior town police officer. He said 10 policemen were also wounded in the clashes. More than 90 people, including three women, have been arrested for questioning following the incident, Abdugheni Osman said. Among the dead was a woman who was wearing a veil over her face, he said, indicating that casualties could be higher. “The number of dead and injured was mentioned in our police station chief’s report just after the incident,” he said. “Maybe there could have been more casualties later, but I’m not sure about that and I believe the higher authorities will issue a special report soon,” he said. Abdugheni Osman said that more than 70 government workers of Aksu City had been sent to Aykol Town to monitor the activities of Peyshenbe Bazaar Mosque as part of security checks since the beginning of Ramadan. Some residents in Aykol town said the clashes could have been triggered by restrictions on prayers. A woman whose 19-year-old son was among those arrested said 15 security forces, nearly all of them armed, stormed into her house on the night of the incident looking for the teenager. “They asked me where I hid my son, I told them he went to get a haircut and never came back,” she said, speaking on condition of anonymity. She said she heard gunshots early Thursday morning as hundreds of security forces took up positions in Aykol town. Villagers told the woman that the clashes were triggered by moves by the authorities to stop residents from neighboring Sayerik town from performing their prayers at Aykol town. An Aykol town farmer, whose grandson was arrested as he left home for prayers at the mosque, said the Eid celebrations were wrecked by the bloody incident. He said he was informed by the ruling Chinese Communist Party’s local committee secretary that youths overturned two police cars and attacked the police when those from the neighboring town were not allowed to perform their prayers in Aykol town. The woman and farmer estimated that hundreds were arrested and that the number of casualties was very much higher than that provided by the police. Xinjiang has seen a string of violent incidents since June 26, leaving at least 64 dead in total, as the region marked the anniversary last month of July 5, 2009 clashes in the regional capital Urumqi between the minority Uyghurs and majority Han Chinese. The rioting left some 200 people dead and 1,700 injured, according to official media reports. Reported by Shohret Hoshur and Rukiye Turdush for RFA’s Uyghur Service. Translated by Mamatjan Juma. Written in English by Parameswaran Ponnudurai.